Jeff Owen, North Carolina State University Extension Christmas tree specialist, knows that growers battle damage from deer, and has done extensive research on what works to minimize deer damage. Owen says one aspect that makes deer difficult to manage is that they’re capable of learning, which separates them from insects that damage Christmas trees. “We have old deer that teach young deer what to eat, what is safe and where to go,” he said. “Deer function as a social herd, and that makes it more complex.” Owen added that unlike managing insect pests, the goal with deer management isn’t simply to kill something or break a predetermined cycle — it’s interrupting behavior. Deer damage is variable, with differences in damage across regions, from county to county, and even among neighboring farms. Owen references a farm that had one kind of deer damage on one side of a field, and different damage from a different herd on the other side. He says this is one reason growers must have more than one strategy. Horning results in broken branches and stripped bark, which often kills the entire top of the tree. For the most part, horning is usually limited to field edges, and often occurs to the same trees over and over again. However, there’s no way to predict when and where a buck will choose to horn. Browse damage of young trees is a significant problem for many growers. Deer bite off buds, tips of shoots, whole shoots or branches, and sometimes the entire tree. Owen says first year transplants are often a deer favorite due to higher salt content coming in from the nursery. “Frasers in particular seem very sensitive to any kind of injury to the stem,” said Owen. Owen says selective hunting can be somewhat effective. “If you take out the mature doe in the herd, you create the greatest disruption,” he said. “They’re the ones that teach the offspring what to eat. There’s a chance at breaking the cycle in the Christmas tree field.” He added that hunting seasons don’t overlap with browsing pressure, and that trophy hunters and hunt clubs have different goals than growers. “They’re after antlers, you’re after managing mature does. There’s a real disconnect and you often don’t get what you need.” Some states have depredation permits, but rules vary by state so it’s important to understand local laws and develop a working relationship with the game warden. 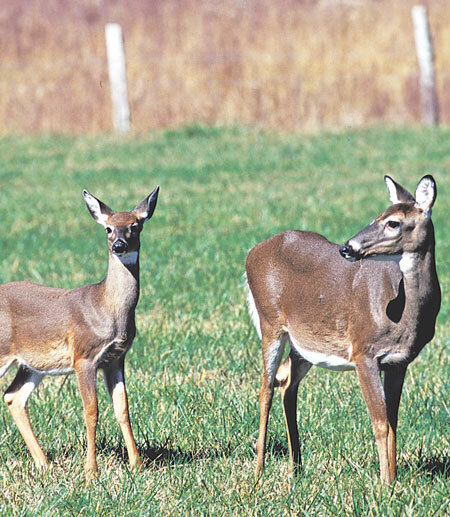 Certain cultural practices can make a significant dent in deer damage, but not all practices are legal in every state. “In North Carolina, hunters can get a depredation permit and leave carcasses in the field,” said Owen. “The carcasses bring coyotes and other predators that could be a further discouragement to deer coming to the field.” He says the practice has been successful when used with deer repellants. Tall, permanent fencing around Christmas trees works in some states. Owen has worked with a variety of electric fencing, including fences that create an optical illusion that changes depth perception so deer think they can’t jump over it. Such fences work as long as deer think they can’t clear such a fence. Owen says some smaller growers use invisible fence to keep dogs within the boundaries to deter deer.